Beaux Frères Pinot Noir from the Northern Willamette Valley in Oregon has long been one of our favorite wines at our dinner table. We decided we had to track down the distributor so we could bring it into our shop and share it with our clients. Beaux Freres means Brother in Law in French and that is exactly how this started. 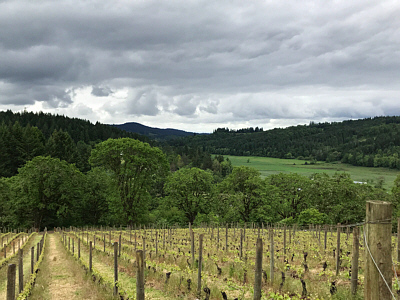 One Brother in Law, Michael G. Etzel, bought an 88 acre pig farm in Oregon and got his brother in law, Robert Parker Jr, renowned wine critic and publisher of the Wine Advocate, to join him in his venture of planting pinot noir and making wine. It is done right: sustainable agriculture, low yields, natural yeast, grapes are sorted by hand to toss out undesirables, caps are hand punched twice a day so they can be familiar with the cuvee, the wines are not fined or filtered, they work hard to maintain the terroir of their grapes. We visited in mid May and were able to walk among the vines, play with the soil, taste a gamut of wines and play with the dogs and the pigs that are on property. Because of the cold wet winter the vines are about 6 weeks behind in growth. To introduce you to these wines we have the 2014 Willamette on sale right now for only $10 off a bottle at $50. 2014 was an outstanding vintage so grab some for yourself and lay it down for a few years. Perfect for Fathers Day and any gifting occasion. Bump up any of our wine baskets with this thoughtful bottle of wine. A medium ruby color. On the nose, this wine has a lush fragrance of sweet dark cherries, baking spices and sandalwood. In the mouth, it is very savory, plush, medium acidity and irresistible. is may be the best Willamette Valley cuvée that we have made to date. is wines sees about 33% new French oak.